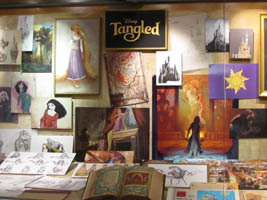 We were at Disney’s Hollywood Studios yesterday and decided to check on the Magic of Animation display area, in case Toy Story 3 had made way for Tangled. 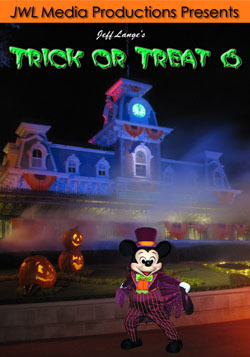 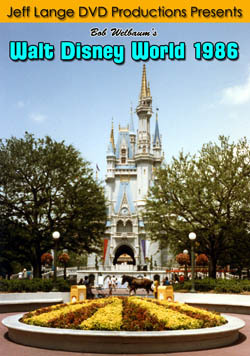 As you can see below, Tangled now fully encompasses this area that has also featured The Princess and the Frog and UP! 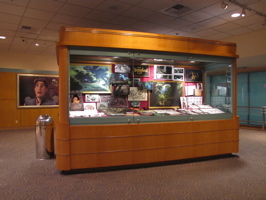 A display case (below, left) holds artwork from the film. 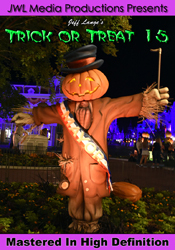 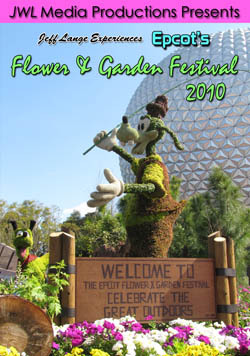 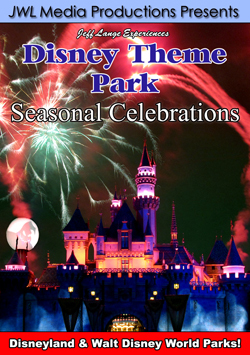 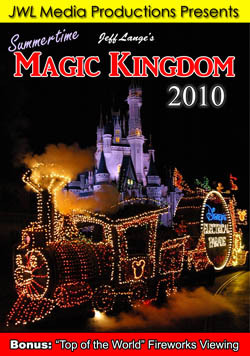 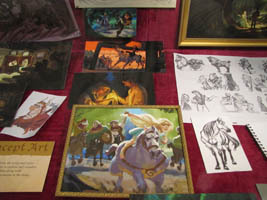 A closer look (below, right) shows the film title, along with art depicting characters and scenes from the film that originally had been titled after the main character, Rapunzel. 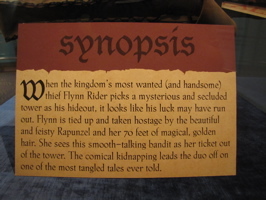 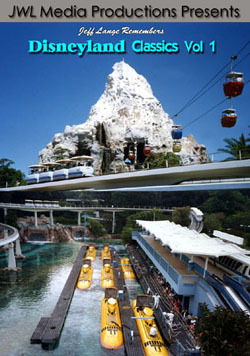 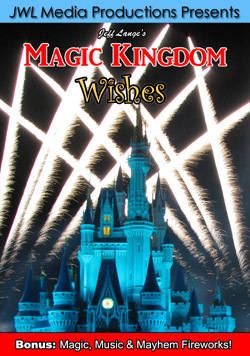 Signs with information about the film (below, left) tell the story of Tangled. 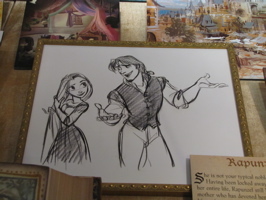 A sketch of Rapunzel and Flynn Rider (below, right) is one of dozens of pieces of artwork in the case. 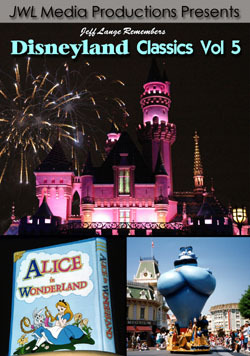 A storybook beginning (below, left) to the story of Rapunzel (below, right). 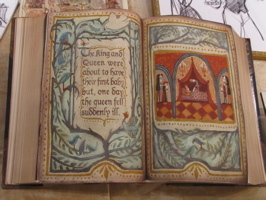 A fairytale book (below, left) helps tell the story of Rapunzel. 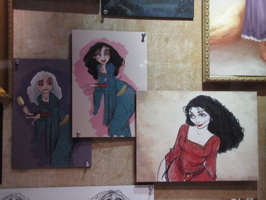 Several renderings of Mother Gothel (below right), who is the parent figure to Rapunzel but also does not have her best interests at heart. 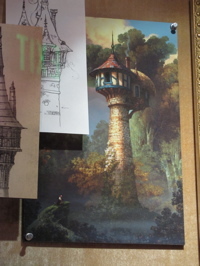 Rapunzel’s tower is seen in both sketch and full-color (below, left). 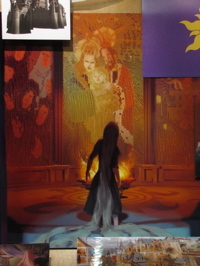 A hauntingly beautiful painting featuring Rapunzel intrigues me – we guess it’s her parents, but I am looking forward to seeing the film to find out more. 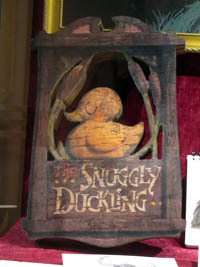 There is actually a book titled “The Snuggly Duckling” (below, left), we aren’t sure this is part of the display – but again, it’s something to learn later. 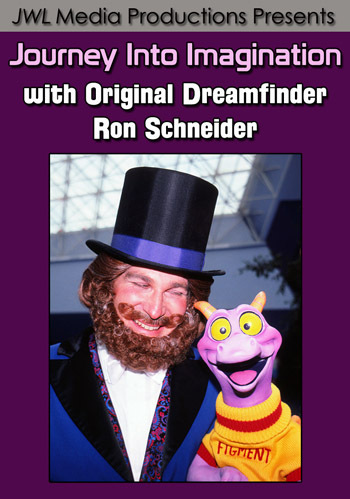 We don’t want to know too much about the film yet. 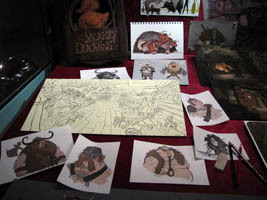 Another portion of the display is devoted to vikings (below, right) – and another piece of artwork in the Story Room (outside of the room this display is in) shows Rapunzel in a tavern with vikings. 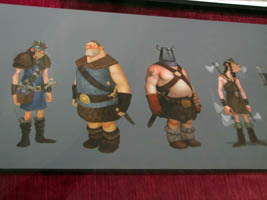 There is a long strip of characters – maybe 16 in all (below left and right), which includes Rapunzel, Flynn, and many of the viking characters. 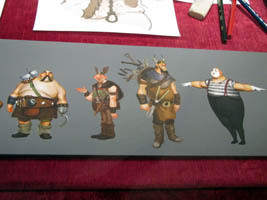 Many of the drawings below contain Maximus, Flynn’s horse (below, left). 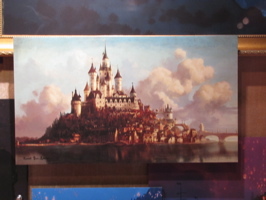 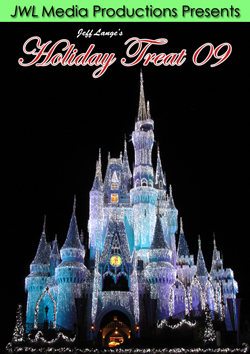 Denise from site partner Mousesteps said that the castle drawing (below, right) reminded her of a combination of Neuschwanstein and Mont. 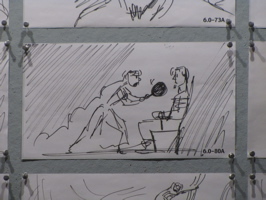 St. Michel. 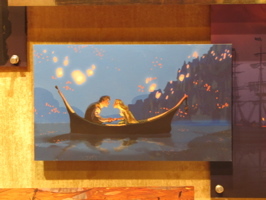 Flynn and Rapunzel in a canoe evoke the memories of Ariel and Eric from The Little Mermaid (below, left). 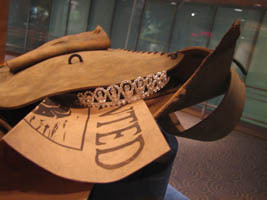 A satchel that seems to belong to Flynn holds a tiara (below, right). 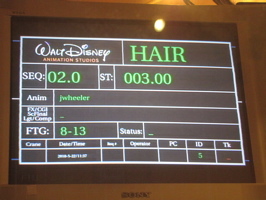 Outside of the display room, a monitor features test animation from Tangled (below left and right). 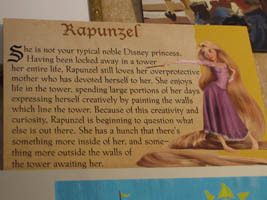 Sometimes the test is called Hair, sometimes it’s Rapunzel, and we think also there was at least one with Tangled. 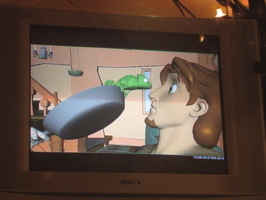 Flynn and the chameleon Pascal gaze closely at each other (below, left). 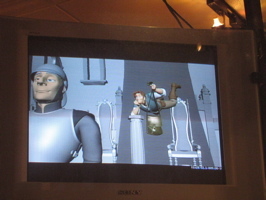 A guard stands oblivious to Flynn behind him (below, right). 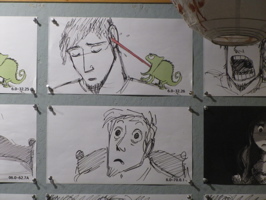 The Story Room was not yet ready, and was very dimly lit – but we were able to get some images from the artwork below that depicts Flynn with Pascal (below left) and with Rapunzel (below, right). 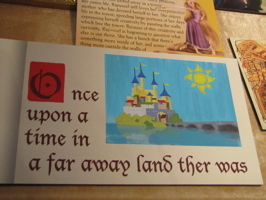 Bonus Video – Disney’s Tangled Display, Disney’s Hollywood Studios 7/31/2010 – Toy Story 3 has been taken out of the display area and removed to make way for “Tangled” (the story of Rapunzel). 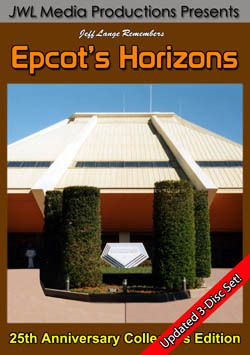 Video taken by Denise from Mousesteps.com. 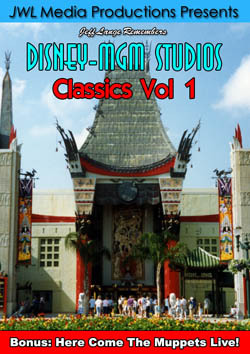 The music played in the room was from a variety of films.